A lot of the designers I follow use Spoonflower designs so I thought I would test some of the fabrics out. My first purchase included some beautiful watercolour cotton spandex jersey designed by Crystal Walen with the lovely title of Mystical Floral. The thought was to make a collection of wireless bras or bralettes for those hot summer days and obviously some coordinating bottoms. So what to do with the fabric. Too many choices. My first thought was the Cloth Habit Watson. 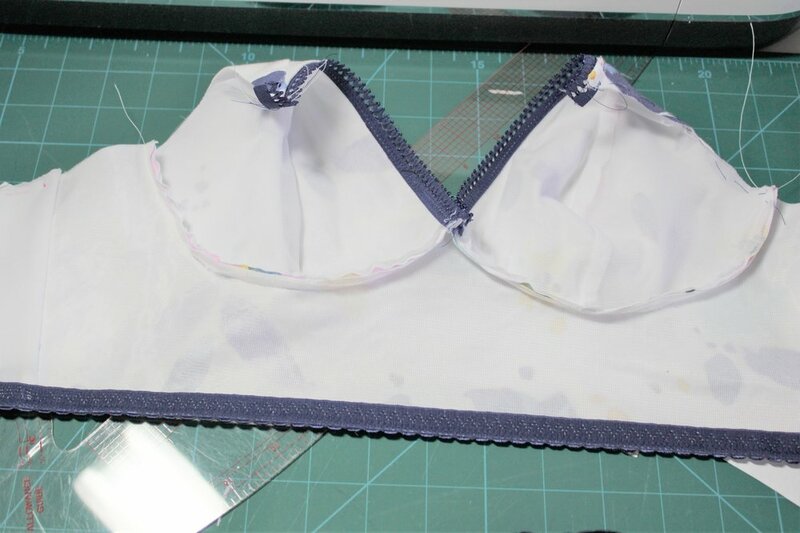 This is a pattern for a stretch fabric bra without wires. Perfect for warm summer days. I had made the regular version last year and it was a fabulous fit. It is The only issue for me is that it does ride up a little. So this time I went for the longline version hoping it would stay in place. Then had to decide what colour trims to use. 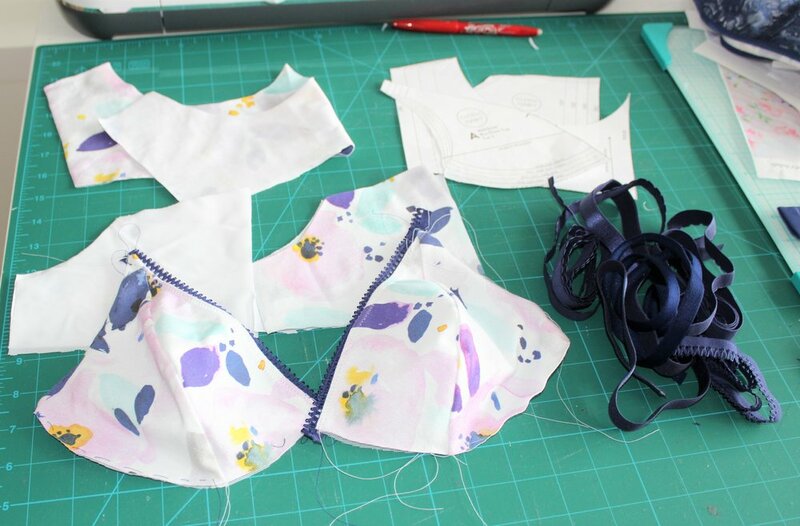 I ordered bra finding kits in navy, grey and turquoise from Fit2Sew along with purple powernet and lace from Sewing Chest. Then found some plum, grey and ice blue fold over elastic from Evie la Luve. I really like the pattern instructions for this bra. There is a good section about what fabrics to use and how this may affect the size you make. What I also like is that Amy gives stitch width and length indications. I found this really useful when I started my lingerie journey last year. For the first set I went for navy as the kits include some pretty neckline elastic. For the cradle I used sheer cup lining to stabilise the very stretchy fabric. I cut the cradle in one piece after using my favourite temporary adhesive spray to hold the fabrics together. For the rest I used a lightweight powernet lining. The patterns doesn't have you enclose the seams but I always prefer to do so where I can. The inner cup is enclosed by the outer cup and then I baste the two layers together all around the cup. My dilemma is always what colour thread to use when the elastic is a contract to the fabric. I tried the navy but looked wrong so I ended up with white on top and blue in the bobbin. The white did show slightly on the elastic but not enough to bother me. Then I enclosed the cradle in the band and band lining. You can just make out the mark for the 1/4" centre point mark where you sew up to for the first cup. Then you sew the second cup from this point. This was little awkward because the elastic had such a fancy picot edge but fitted together pretty well. A year on and a little more fussy about the inside of my makes I decided to tackle the unfinished seam. The next step is to topstitch the seam allowance to the cradle. I decided to use my coverstitch with wooly nylon for the underneath as it gives great coverage. Pretty pleased with the result. All looking so neat and tidy. Before I put the strap elastic on I had to adjust the band as I didn't have a long fastener. Quite a bit to take off so I got out my french curve to ensure a smooth blend. I then pin the bands together and cut in one so match exactly. Although a small kit the strap is quite wide but actually helps the look bringing out a little more of the navy. The bow came with the kit so decided to use. I found a tiny bit of navy lace which was just enough to make the lace overlay Binky which I have covered in earlier blogs. This new pattern from Evie la Luve is so versatile and a great fit. Perfect partner for summer lingerie. Pretty and comfortable!